Specials: Large discounts on many trips, including early bird! 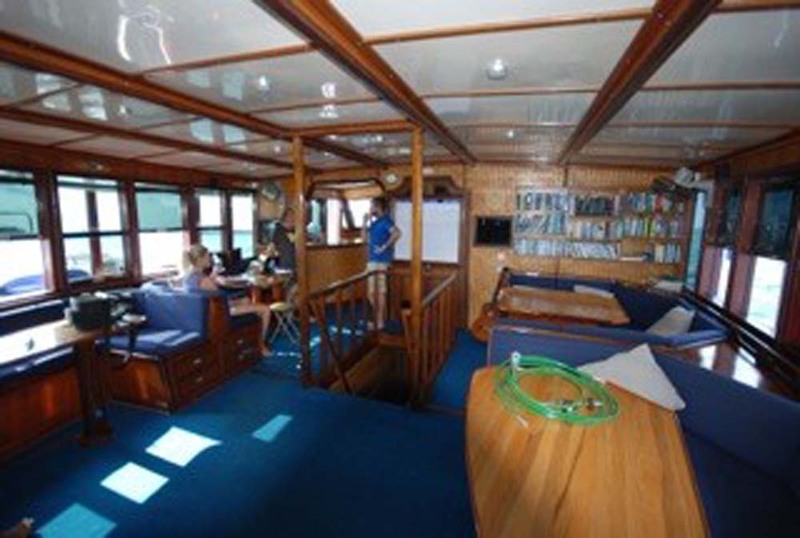 Not all Maldives liveaboard cruise ships need to be large and expensive to spend time on. 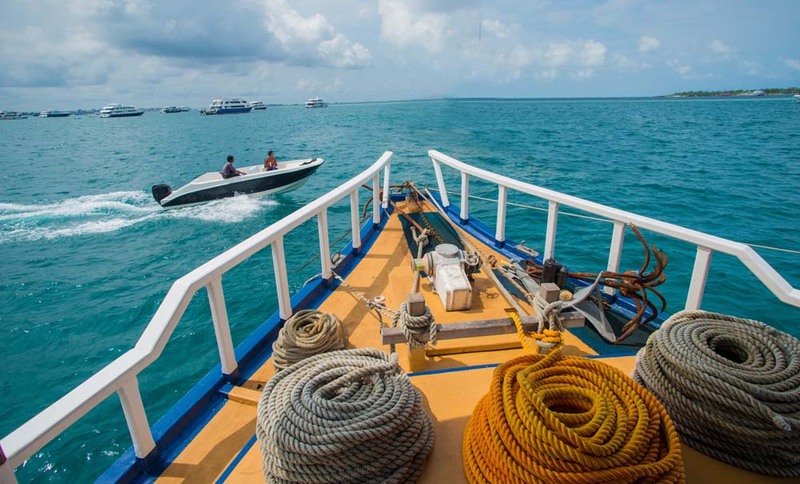 However, most of our Maldives diving guests still want air-conditioned en-suite cabins, the best food & service, and diving safety & professionalism. 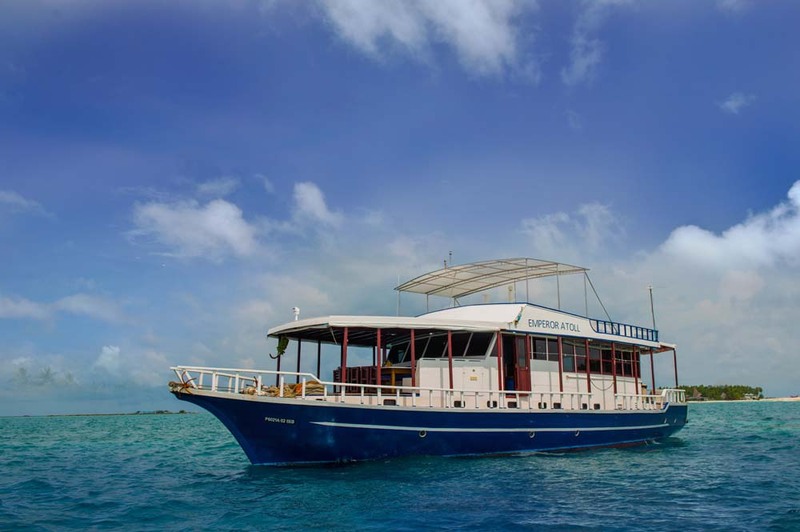 Emperor Atoll is the perfect balance of affordability, comfort & great diving, and with no more than 12 guests on board, each cruise is personal and never crowded. The boat operates from Male, offering week-long diving cruises to the best Maldives dive sites at any given time of year, all year round. 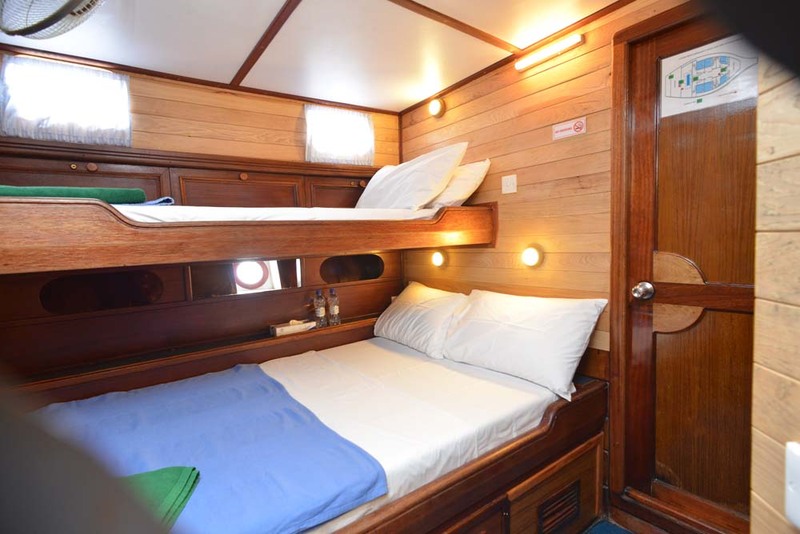 The lower deck of the boat has 6 en suite cabins. Each has a fan, air-conditioning, a double bed & a single bunk. Therefore, couples, solo guests and friends can all enjoy the bed layout. 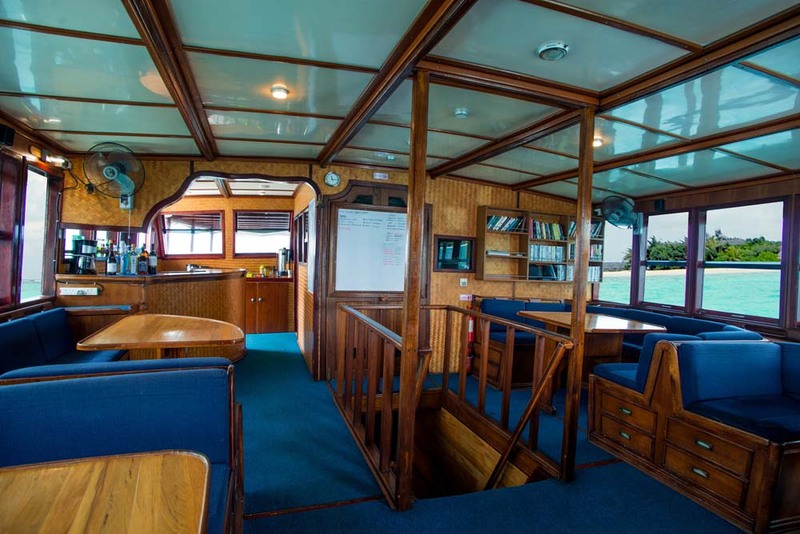 The main deck has several communal areas, which are easily large enough for guests to find somewhere peaceful & private or congregate in a group. 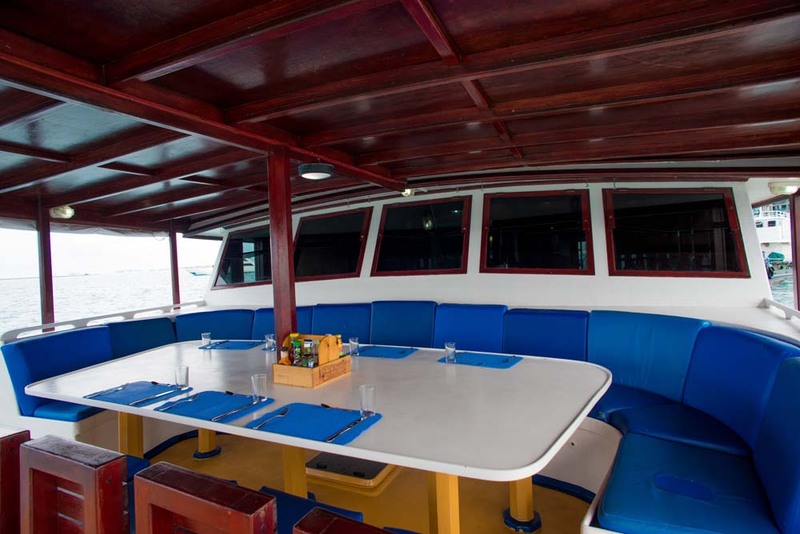 Depending on the weather, the delicious buffet meals are served in the large indoor dining room or outside under cover at the front of the captain’s wheelhouse. 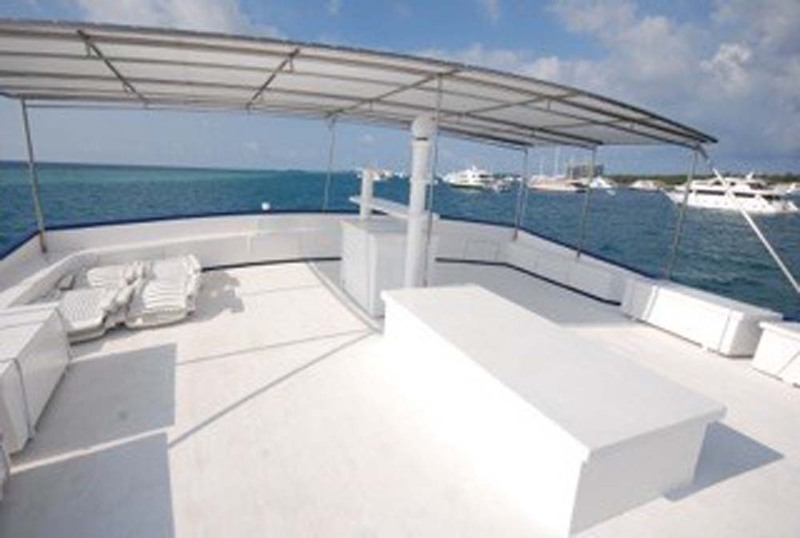 There are sofas, tables, a sundeck and large flat-screen tv & entertainment system for guests to enjoy between dives. This is ideal for showing videos and pictures of the day’s diving over a drink from the licensed bar. Wi-Fi is available at a small extra charge, when in range. Divemaster services, Nitrox fills (for certified divers), tanks, weights & weightbelts are included in the excellent rates. 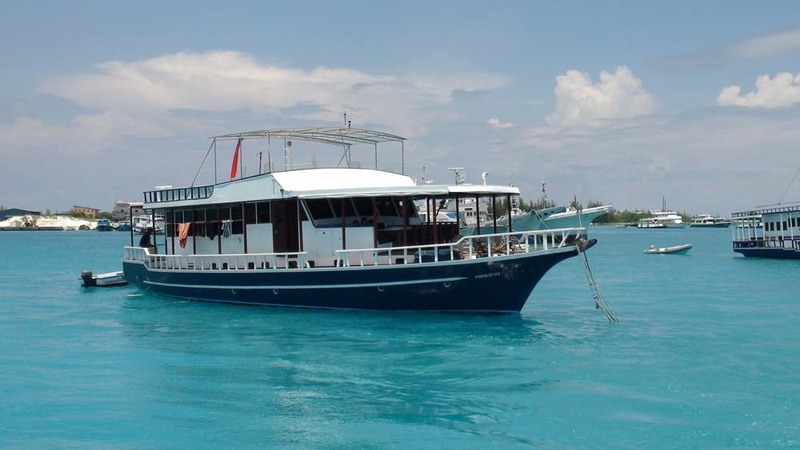 Finally, due the boat’s small guest capacity, it is one of the most popular to charter for small groups to enjoy private diving cruises at The Maldives. Compressors: 2 X Bauer K14 (640lt Per Minute @ 230 Bar) / 12 Lt Aluminium. Instrumentation: GPS, Fish Finder, Echo Sounder, VHF/CB Radio. Camera Facilities: Power Sockets For Battery Chargers And Flash, Camera Rinsing Tank And Camera Preparation Area. Transfers: There are free transfers from and back to Male International Airport at the beginning and end of each cruise. These are scheduled transfers, at set times. However, there are three pick up times (11.00am, 4.00pm and 10.30pm) and two check out times (7.00am & 9.00am). The boat is moored very near to the airport and the drive is usually no more than 10-15 minutes. Guests staying at a local hotel before or after their Emperor cruise need to visit the airport to join the transfers. Those who need to be collected at a time outside the schedule can contact us or the team to arrange inexpensive private transfers.